The latest headroom rangehoods from Miele Australia feature dimmable atmospheric lighting integrated into a 90cm canopy, creating a striking focal point in the kitchen. A recent winner of an Australian 2017 Good Design Award, the Miele Pearl stands out for its canopy, which is pitched to allow even tall users to comfortably peer down into pots and pans on the cooktop below. The canopy consists of a bowed sheet of toughened safety glass in a shade of white to match the brilliant white on Miele built-in appliances. 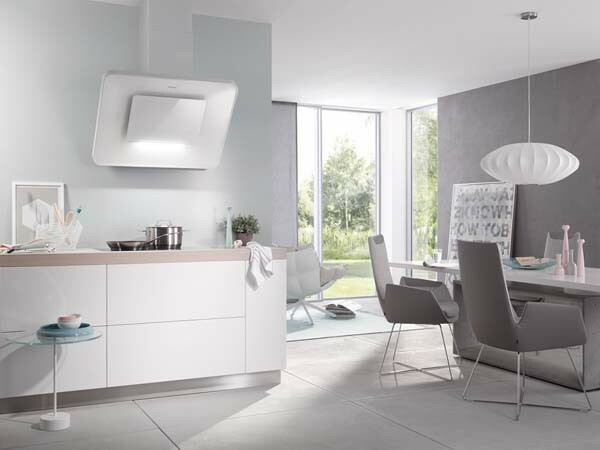 Key features of the Miele Pearl headroom rangehoods include powerful and energy-efficient Eco motor; LED light strip providing downlighting characterised by low energy consumption; rated A+ on the European energy label, the best rating awarded to rangehoods; quiet operation in vented or recirculation mode options; and rear venting facility eliminating need for chimney section. The Pearl features Miele's [email protected] 2.0 that enables the rangehood to automatically adjust suction power to what is actually cooking on the cooktop below, ensuring a pleasant room climate while allowing the user to concentrate on cooking. [email protected] 2.0 is compatible with 10 Miele cooktops and is easily installed. The Miele cooktop unit transmits its settings via an RF link to the extractor. A practical remote control is also available as an optional accessory for extra convenience. The Miele DA 6996 W Pearl is on display at Miele Experience Centres around Australia and available to order through all Miele Authorised Retailers.